Roy Mangersnes - More snow?? Penguins breeding along the coast on the Antarctic peninsula are all laying their eggs on bare rock. With global warming one would expect breeding conditions were getting better for them, but it’s not. The rise of temperature leads to more moisture and precipitation, basically meaning more snow. The breeding season in Antarctica is very short, but with even more snow it will be shorter in the years to come. Already there are evidence showing a negative trend in the Penguin colonies along the coast. 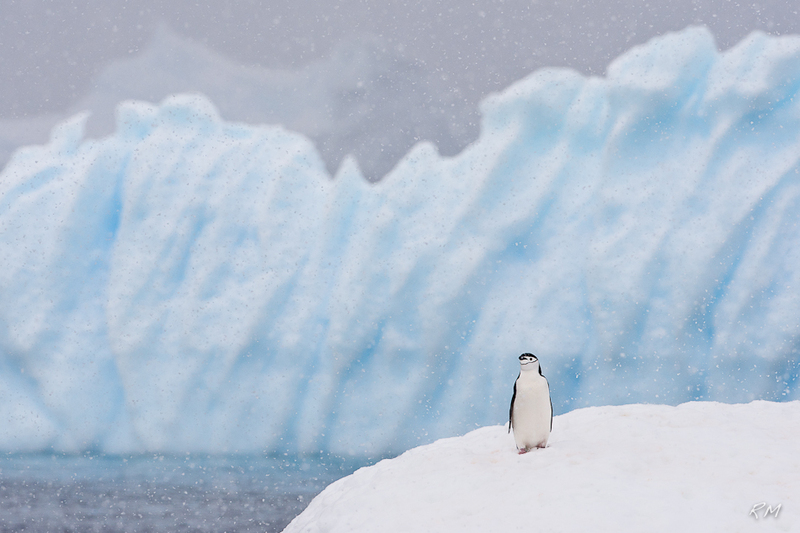 This lone Chinstrap Penguin was on of the last ones I photographed before I left the continent. It was already summer here and the birds were anxious to lay their clutch, but then more snow came. That photo needs to be on the cover of a Christmas card! Without your comment I would only have thought that this is a really great picture of a penguin. Now I look at it with mixed feelings. It is still perfect but with a sad context. To know too much isn't always good! No, just kidding - it's interesting and important to learn something about the story "behind". What a paradox. The penguin seems to be smiling and happy with everything. I laughed, when I saw this picture. But your story reaveals the real situation. I think this is a photo with a deep message that things are not always what they seem to be.